I arrived here last Saturday, hanging out at Hollywood, less that 20 miles north of the Wynwood Arts district in Miami, where I'm helping Norfolk's Meyer Fine Art and Philly's Projects Gallery hawk some of my artwork at the Red Dot Art fair, which this year shares the block with Scope, Art Asia and the grand daddy of all Miami art fairs, Art Miami. First night headed to my favorite restaurant on the Hollywood Beach boardwalk, the unexpectedly delicious Sushi-Thai Restaurant, where for $7.95 you can have the mouth-watering Ika Shukgata Yaki (whole grilled squid in ponzu sauce) and a cold one while looking out at the ocean. Today I drove to Wynwood and from 11am until 7pm it was all about hanging artwork at MFA's booth. MFA is showing work by yours truly, as well as Cuban artist Sandra Ramos, Norfolk's John R. G. Roth, Robert Sites, and Shiela Giolitti, Lynnvale's Lou Gagnon, Charlottesville's Michael Fitts, Prague's Alexey Terenin, and DMV's Joey Manlapaz, Rosemary Feit Covey Andrew Wodzianski and Judith Peck. I'm stoked about this fair because it will be the first ever showing of my first video drawing. I had an interesting experience upon checking in, during which somehow I ended up checking in and getting badged (by mistake) into Scope, which is the big tent next to Red Dot, but more on that later. The grand opening is tomorrow night. Recently I had the pleasure and honor to select the current small photographic works at Multiple Exposures Gallery in Alexandria. It's wonderful show, if I may say so, and continues this trend that I've been writing about recently, about the unique experience of artwork in a small, intimate scale. MEG is home to superior, highly talented photographers. In the many years that this photography collective has been around (formerly known as Factory Photoworks), and in the dozens and dozens of shows that I have seen there, seldom, if ever have I seen a weak show. If you are a photography fan and you haven't been to MEG, then you're missing one of the key photography spaces in the Mid Atlantic. Every selection in this show is a gem. 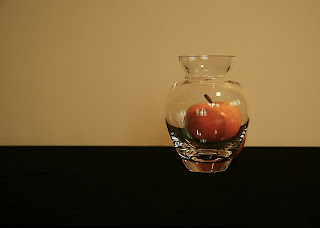 In Susan Meyer's "Apple in a Vase," the sheer simplicity of the image hides the smart compositional idea behind it. The super sharp focus of the photo also does wonders to bring our attention to the subject, and (as I did) speculate why there's an apple in a flower vase. I was also quite pleased not only with the superior set of works submitted by Michael Borek, but also with the super-modern, sharp minimalist presentation, where Borek has the small works floating in a deep white frame. I might "borrow" his presentation concept for some future works of my own! There's also the scent of a master photographer in Grace Taylor's "Three Red Pears." Here we see what can be best described as the subject emerging not only because of its inherent beauty and recognition-factor, but also because the way the Taylor handles it, massages it and presents it; the pears emerge as exotic, sexual fruits, awaiting the first touch of the lips and the first cut of the bite. Luise Noakes' visually textured, added onto and manipulated photos as well as the always impressive work of Danny Conant also stand out. The Small Works show goes through January 2, 2011. An exhibit entitled “Journey” of the paintings of Freya Grand was on view at the Greater Reston Art Center (GRACE) until November 12th. I had made the pilgrimage out there to see the show (and it did seem a pilgrimage from my home in Colesville, MD), and meant to write a review while the show was still up. Swamped with other work, I didn’t make it. Yet, I feel that some thoughts about this remarkable artist are in order, even now that the show has closed. 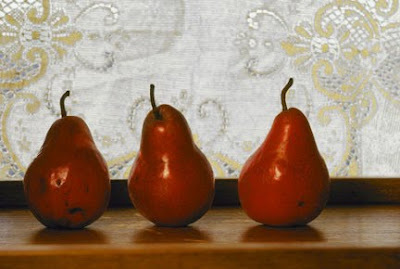 The first word that comes to mind looking at these paintings as a group might be “sublime”. When thinking about that rather slippery concept as applied to art, one might be imagining something by Turner or Caspar David Friedrich, artists who did try to embody eighteenth-century writer Edmund Burke’s aesthetic notion in actual works of art. The sublime is a feeling that involves an element of fear, something beyond the merely beautiful or picturesque precisely because of that fact. It is something that we experience in nature, as at the edge of the ocean at night when we look out at the horizon, and feel simultaneously exhilarated and overwhelmed at the greatness of what is in front of us—part of that huge sky and water—knowing full well that it would be death to move into it. The experience can occur in art as well, and this was, of course, at the core of Romanticism. 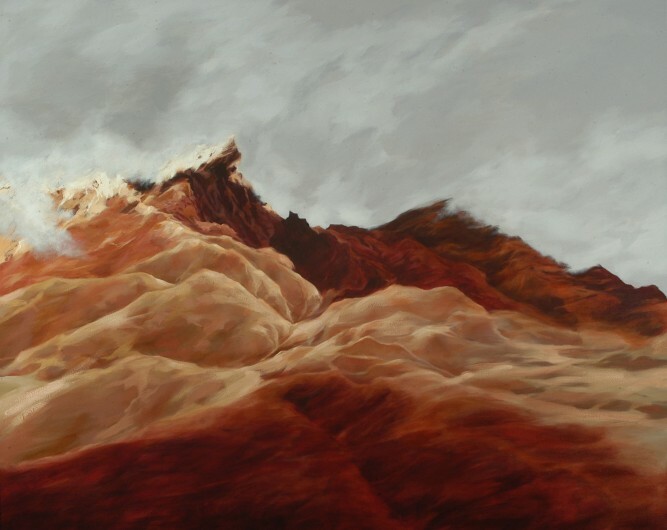 I think the most moving thing about Freya’s paintings is the way that they so completely convey this sense, and the feeling that one is experiencing what the artist experienced confronting the natural scenes represented in these large scale paintings. These are not realistic works, and, although descriptive, do not reproduce the visual record so much as the experiential one. It’s that sense that we are there with her, viewing the volcano Cotopaxi, as thrilled as Frederic Church (Freya’s art great grandfather) had been more than a century ago. Or seeing/feeling the tides pulling out at the water’s edge in Beach. Because these paintings are so full of experience, they provoke memories in the viewer of his/her own moments of the sublime. They rushed in on me as I looked, and kept me looking, and thinking for a long time.